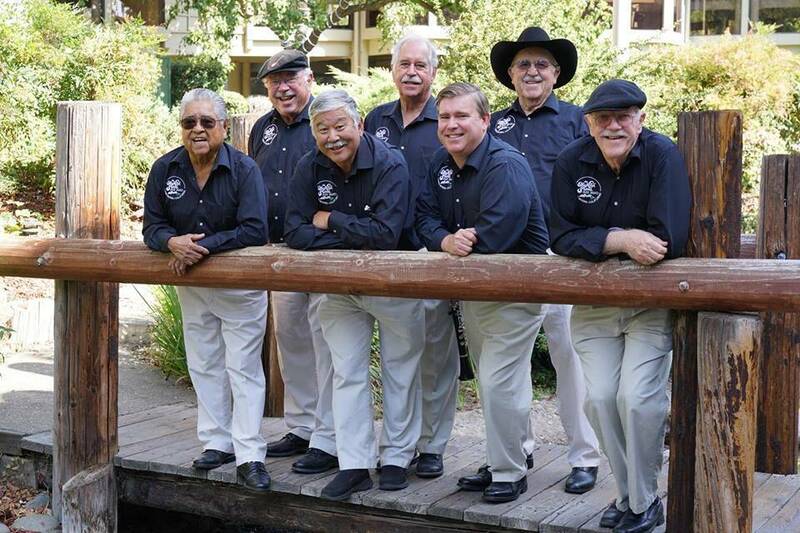 Around five o’clock on Sunday, April 14, 2019, in the Three Rivers Lions Arena in the foothills of California’s Sierra Nevada Mountains, when Earl McKee sings “We’ll Meet Again,” the song that has concluded the final set of so many of their appearances over the past four decades, the High Sierra Jazz Band will bring to a close 42 years of performing as one of the country’s top traditional jazz bands. And in all probability, there won’t be a dry eye in the hall. These jazz ambassadors single-handedly put Three Rivers, a rural community with slightly over two thousand residents at the gateway to Sequoia National Park, on the world map. Three of the members—Earl McKee, Charlie Castro and Bruce Huddleston—were in Three River’s original jazz band, Celebrated Jazzberry Jam that Leuder Ohlwein organized in 1970. That band was reorganized in 1976 as the High Sierra Jazz Band and operated as a six-piece ensemble for the next 22 years. Earl McKee’s wife Gaynor provides a bit of insight as to how the band initially started. “If my cousin Terri had never taken that trip to Ireland in 1967, there never would have been jazz in Three Rivers or a Jazzaffair. It was in Dublin that she met (and later married) German-born Lueder Ohlwein, who played the banjo and kazoo and sang.” When the couple arrived in Three Rivers in 1969, Lueder promoted the idea that a jazz club was vital to a community if the music was to survive. So in 1976, cornetist Al Smith became the leader, Vic Kimzey was on trombone, and Stan Huddleston replaced Ohlwein on banjo, joining his brother, pianist Bruce Huddleston, drummer Charlie Castro and Earl McKee—he of the black cowboy hat and sousaphone—from the remnants of Jazzberry Jam. When Kimzey retired in 1989, he was replaced by Howard Miyata. Al Smith left the band in 1998, with Pieter Meijers (reeds) taking over as leader, and Bryan Shaw and Cory Gemme filled in on trumpet. Marc Caparone signed on as lead trumpet in 2013. The current players have all held full-time jobs over the years. Pieter Meijers, who has a doctorate in nuclear chemistry and physics, is Senior Conservation Scientist at the Los Angeles County Museum of Art. Howard Miyata, who is also an accomplished tuba player, is a junior high school band teacher. Marc Caparone is involved in a family winery in Paso Robles, California that specializes in rich, complex red wines. Earl McKee has been dealing with some health issues of late, so is not hoisting his sousaphone during performances anymore. On his recommendation, Paul Hagglund of Seattle has been hired to fill in for Earl at the band’s remaining engagements, although Earl contributes his unique, heartfelt vocals whenever he is in attendance. Perhaps the late K.O. Eckland said it best when he wrote the liner notes for the band’s 10th recording in 1986—an LP no less. K.O., who tickled the ivories for such august groups as the Firehouse 5 + 2 and the Desolation Jazz Ensemble + Mess Kit Repair Battalion, authored two compendiums of West Coast jazz organizations, bands, and musicians, so had more than a casual view of the bands that were performing on the festival circuit back in the 1980s. We sure have! You guys will be missed, but thanks for all the pleasure and good times you have brought us over the past 42 years.